Save Mart Center offers more than 2,900 parking spaces available in the North lot off of Matoian Ave and the East lot off of Chestnut. Additional parking will be available in Lot V just west of the arena on the Fresno State campus. 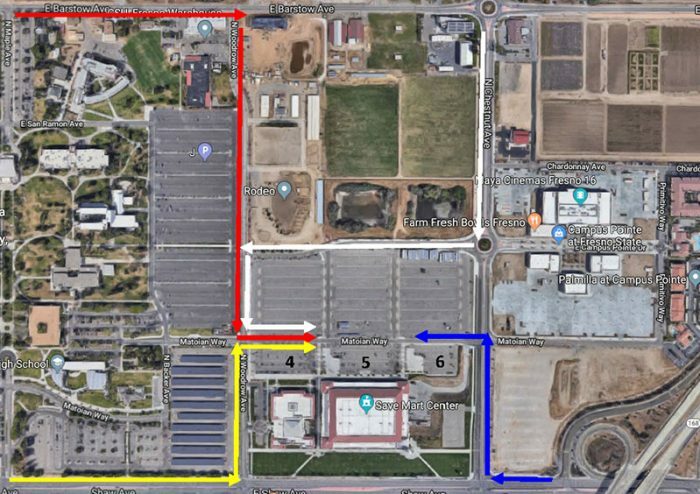 Parking in additional campus lots may be permitted based on show. Please call 559.278.3400 for more information. There are 53 accessible parking spaces in the North lot for our guests with disabilities. Vehicles legally using disabled license plates or window cards are permitted to park in these designated spaces. Accessible Parking fees are the same as listed above. Prior to arriving to the building, determine which lot best meets your needs when exiting. To access Lot 4 – Follow the yellow or white routes above. Try to avoid the red route as you could be delayed with campus traffic. To access Lot 6 – Follow the blue route above. For your safety and the enjoyment of those around you, tailgating, picnicking, or consuming alcoholic beverages is not permitted outside the Save Mart Center. Persons who violate the rules may be asked to leave the parking lot, be denied entry to the facility without a refund, as well as receive a citation from university police. Thank you for your cooperation and enjoy the event.